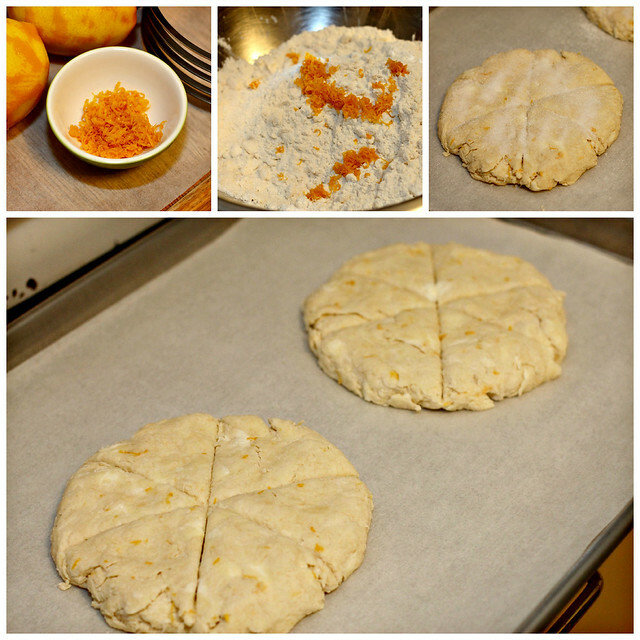 I made these scones in January and am finally getting around to posting them. I can't believe today is the first day of June! What happened to 2014?! This is a super easy recipe. It uses buttermilk instead of heavy cream so I think it has a bit fewer calories (but don't worry, it has a stick of butter so it's plenty rich). The lemon flavor is delicate as zest is the only lemon flavor used in the recipe. Remember, when making scones, you should be able to see little bits of butter. When heated, the water in the butter will create steam and cause the dough to puff up. 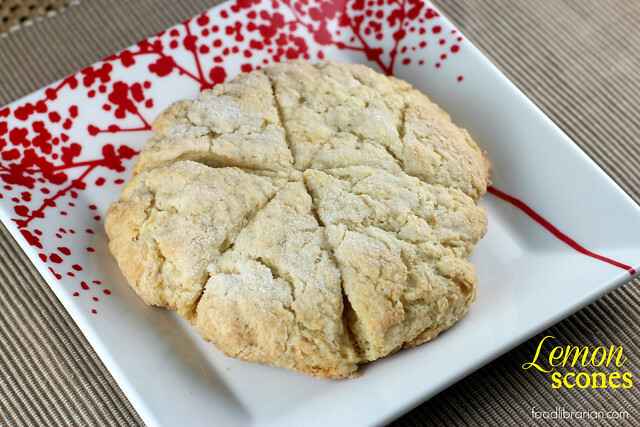 The original recipe from Taste of Home says you should make one large circle and cut it into 10-12 scones. 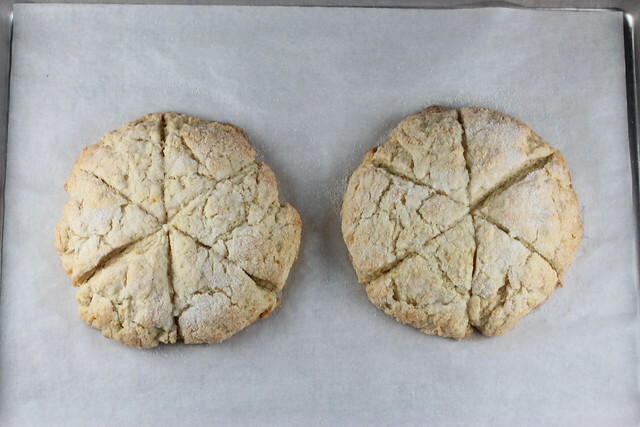 However, I made two circles and made 12 scones from the two circles. These are perfect with a cup of tea or coffee...perhaps some lemon curd or jam too. In a medium bowl, whisk together flour, sugar, baking powder, baking soda and salt. Using a pastry cutter, two knives or your fingers, cut the butter into the flour mixture until the mixture resembles crumbs. Stir in the lemon peel. Pour the buttermilk over the mixture and stir until just mixed. Turn onto a floured surface; knead a couple times and shape into two balls (or one big one). Place the ball on a parchment paper covered baking pan, and pat into a 1/2" to 3/4" thick circle. Using a knife, cut circle into wedges but don't go all the way through the dough - you are just scoring the dough. Sprinkle with sugar. Bake at 350 degrees F for 20-25 minutes until lightly brown on the bottom and edges. Enjoy! These are good on their own, and can be served with butter, jam, or lemon curd. I've made these twice now, once as per the recipe, and once with an added 3/4 cup of fresh blueberries and a simple lemon glaze on top. Same problem each time: They don't get done in less than 30 minutes, by which time they are a both browner and drier than I would like. But if I take them out of the oven after only 20-25 mins., they are doughy inside. Yuck. Flavor-wise, they're great. 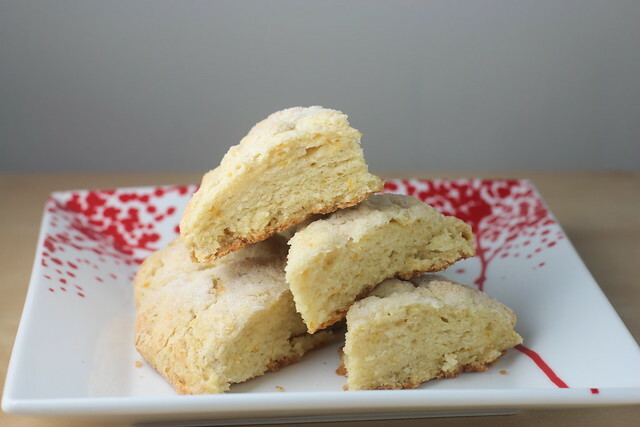 I used the plain lemon ones as the shortcake for strawberry shortcake; they are also great with honey or jam (homemade cherry jam was great on these!). The blueberry/glazed ones are for eating as they are. But I did not find this to be the perfect scone recipe I had hoped for.